The IT guy, Jacob left last month: to begin with. There is no doubt whatever about that. He left without an exit interview, and he didn’t seem very pleased with the way the situation played out. You could never tell if Scrooge cared or not. His demands have never wavered. He expected perfection and when mistakes were made, they were approached as catastrophic affronts to the sustainability of the business, even if that wasn’t the reality. Scrooge, not missing a beat, and never altering his demanding demeanor, laid the responsibilities that were, up to last month, Jacob’s, at the feet of poor old Bob; with, the expectation that Bob would be able to produce more. Bob was ever the diligent worker, and he never complained, regardless of how much unwanted attention and responsibility was forced onto him. As the holidays approached, Bob was looking forward to the respite from work, even if it was for a day. He was going to spend time with his family. You see, Bob’s daughter Grace fell ill and since Scrooge didn’t believe in offering benefits, the burden of keeping her well fell on Bob’s shoulders. Just as he did the best that he could for Scrooge, he did the best that he could for his family. The problem was that Christmas is tomorrow and there has been no mention of him getting the day off. At about 1 p.m., after he had eaten the soup his wife had made (the same soup he had been eating for five consecutive working days), he went to Scrooge. “But Mr. Scrooge,” Bob pleaded, “My wife is making a roast and I am hosting Christmas.” He went on to observe that it was only one day a year. Bob went back to work and toward the end of the day, Scrooge emerged from his office, put on his coat and meandered over to Bob’s desk with a box. He stopped, placed the box on the desk and placed his hand upon the box. “Bob,” Scrooge started, “I was thinking about your request for time off, and I wanted to tell you that since Jacob left, we just can’t have anyone missing any more time, so just tell your family to come after you get out of work.” Bob was upset, but said nothing. Without saying goodbye, the old miser walked out the door and shuffled up the street toward his car. Bob felt crestfallen. He knew his brother and his family would be at the house when he got home, but not wanting to disobey Mr. Scrooge’s demands. He stayed until just after 8 p.m. making sure that the router was installed properly and that it did, indeed provide Mr. Scrooge’s office with the wireless signal he demanded. After he finished with the router, he locked up the office and meandered down the street toward his car. Since Scrooge has kept both parking spots in front of the office for himself, Bob had to walk a half a mile to the parking garage. As he made his way there he went into the store to buy his family their Christmas roast. Knowing he wouldn’t be around to enjoy the company of his loved ones, he could at least get a beautiful roast. He started pricing the meat and realized that he couldn’t afford a roast that was big enough for eight people. He checked his balance, and when the numbers came up on the screen he felt like he wanted to cry. He picked up a small roast and a large chicken, paid, and left for his home. When Bob got home, his entire family was there. The sadness he was feeling melted away and the Christmas spirit that had escaped him returned with aplomb. His brother’s family had arrived a few hours before and so, after tucking their children in for Christmas, the adults sat around the Christmas tree telling stories and laughing, stuffing stockings, and putting out gifts. Bob didn’t know exactly how to explain that his boss wouldn’t give him the day off, but waited to reveal this sad truth for after the pleasantries of the evening were finished. As he got ready for bed he shared the news with his wife. “That Scrooge is a real piece of work,” his wife proclaimed. “He’s a real piece of something,” Bob returned. The couple talked about it a bit more, said goodnight, and went to sleep. Scrooge, was sitting alone, as was his custom at a table in his club’s bar. His scowl was a solid deterrent to keep people away. He sipped his scotch and water and sat there watching the television that was mounted above the bar. The financial news was on. As the stock prices raced by and the attractive, yet muted 30-something gave the audience the recap of the money that had been made and lost during the day’s trading, his concentration was broken. “What? !” the ill-tempered codger snapped. “Merry Christmas.” the man said joyfully. The conversation went on like that for a few minutes and Abraham Brown left his card on the table and wished Scrooge a merry Christmas. Scrooge predictably scoffed at the sentiment. In solitude he finished his drink, paid the bill with no tip, and left the club. When he got home, he locked the door behind him and put on his dressing gown and nightcap. Just as he was getting comfortable in his bed, he heard a tapping, which he ignored. A minute later a banging came from the front room. He got up to investigate, grabbing his cane. Discovering nothing, he returned to his bedroom, only to find Jacob sitting at the small writing desk he had up against the far wall. “What the hell are you doing here? !” Scrooge said aggressively. “I’m not here, Mr. Scrooge. I’m not. I am a figment of your imagination.” Jacob stated matter-of-factly. Scrooge charged at him and swinging his club to accost the intruder only served to break the lamp on the desk. Just then Jacob let out a wail that got Scrooge’s attention. He then asked Scrooge to check his account balances, and after a little back-and-forth, Scrooge placated the spectre. The look on Scrooge’s face was of pure terror. “Three spirits?” Scrooge asked, terrified. Just then, the room was silent. Scrooge was horrified. He turned every light on in his house and turned on the television. After at least an hour of trepidation, he finally started to get tired, and even though his home was lit up like a jack-o-lantern on Halloween, he dozed off on his sofa. “Wake Up!” the spirit shrieked. Scrooge arose from his peace-less slumber quickly and alertly. He took a swipe with his cane, but was rebuked by the large ethereal man standing before him. The ghost was around six-foot-four, but had a golf shirt embroidered with Scrooge’s company’s logo on it tucked into a pair of khakis. Its hair was seemingly an ethereal mist that looked like there was smoke coming up from his glasses. His eyes were ominously white behind thick black glasses. “Are you the Spirit, sir whose coming was foretold to me?” Scrooge asked. “Long past?” asked Scrooge who was trembling with fear. The spectre put his hand on Scrooge’s reluctant shoulder and led him to the door of his home. Instead of opening the door, they traveled through it only to find on the other side a vision. The vision was of Jacob talking with Bob. They were talking about how Jacob had went to Scrooge, and asked him to consider getting on a firewall installed on the business network. “I remember that. He was asking for too much money!” Scrooge said defiantly. The spirit said nothing and put his hand on Scrooge’s shoulder again. They walked back through the wall they had just come through and this time it was a school. It seemed to be sometime in the 1960s. There was a little boy who was trying to open a padlock with paperclips. The boy opened the locker that was being protected by the padlock and took out a small bag. “It was him!” Scrooge screeched. He got emotional and explained that he had brought his dad’s watch into school the day before Christmas and he had kept it in the bag. When he returned to the locker that day, it was open and his father’s watch was gone. “I bet he skinned your hide,” the spirit said arrogantly. “My time is running short, Scrooge. Let us go,” the spirit said, as he put his hand on his shoulder and walked through the wall. He was back in the front room of his house. No one else was there. He called out to the spirit but nothing answered. Just then there was a banging coming from the bedroom. He went to investigate and there was a larger spectre standing in front of his bed. “Scrooge!” the new ghost bellowed. Scrooge turned around and shut the door, only to turn around to see the giant ghastly man. This spirit was nearly seven-feet tall, his head was covered in a hood. He couldn’t make out any of his features, except two glowing eyes that seemed to puncture a hole through him. “No! No more hauntings!” Scrooge plead. The ghost lifted his right arm and snapped his ethereal fingers. The snap was the loudest noise the miser had ever heard. Scrooge, who had closed his eyes to avert his gaze from the newest spirit, opened them and found himself alone in a dark room. ‘Where am I?” Scrooge called out. No answer. He noticed a light coming from an adjacent room. He made his way toward it. As he entered the doorway he could see the ghost standing over what looked to be Jacob, his former IT administrator. Jacob was typing at a computer. ‘Come, Scrooge,” the spirit said in his baritone tenor. When I bailed on old man Scrooge, I left a hole in the network. Tomorrow, I am going to go in and put this ransomware I just purchased. When he gets back from his Christmas break, he’ll have a surprise waiting for him. “What is this? What is ransomware?” Scrooge asked the spirit timidly. “I can’t tell you that, but I can tell you that it is not good for you or your company.” The ghost replied. “Tell him to stop! Tell him to stop!” Scrooge began pleading. “No one can hear you, Scrooge.” The spirit said as it walked out of the room. Scrooge followed, but as soon as he got into the next room, there was no one there. He turned around and seemed surprised to be in his office. He walked through his office door to see the spirit standing over Bob’s desk. Bob was sitting at his desk working away, gently sighing every once in a while and checking his phone repeatedly. All of a sudden his desk phone rang. “Merry Christmas to you too...Mr. Scrooge needed me to work today, so I am...Well I have my brother and his family...She’s doing well...It’s okay...I’ll think about it...Have a merry Christmas.” Bob hung up the phone and went back to doing what he was doing. 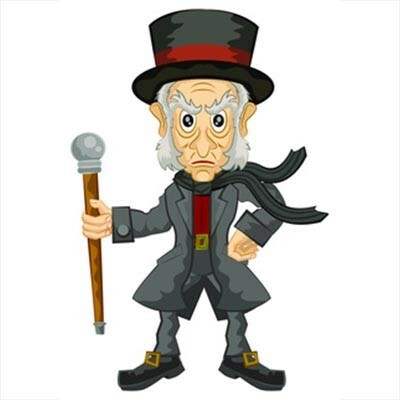 “He’s a good worker.” Scrooge admitted to the spirit. “You just couldn’t give him the day off for Christmas?” the spirit asked directly. “I…I...We’re so short-staffed as it is…” Scrooge stammered. Bob’s cell phone rang. “Hey...What? !...I’ll be right there,” Bob stood up with a panicked look on his face. He put his coat on and walked out the door without turning his computer off. “Where is he going? Where is he going, spirit?” Scrooge plead. The spirit again snapped his fingers and the pair were standing in the waiting room of a hospital. Bob was standing at the desk filling out paperwork. A doctor came up to him and started to talk. Bob’s face succumbed to the pain of the situation. The spirit lifted his arm again. SNAP. The pair were on the front lawn of Bob’s house. A car pulls into the driveway. Bob’s wife got out of the passenger seat. She had clearly been crying. Bob got out of the front seat and made his way around the car. His wife muttered something to him while he opened the back door of the car. Bob lifted his tired and weak daughter out of the car seat and followed his wife in the house. “Not very Christmasy,” the tall spirit said, mocking a relieved Scrooge. Before Scrooge could say anything else there was a huge bang and he was back in his home. Feeling tired and emotional, Scrooge sat down on the settee in his front room. He sat there in contemplation for a few minutes. He was worried about the virus that Jacob was going to unleash, he was worried about his business, and about Bob and his family. He realized that he hadn’t treated these people with a lot of respect. Just as he was coming to the conclusion that he had to do something about it the room filled with a blinding light. A silhouette emerged in the light. Witless and afraid, Scrooge complied. The spirit was no more than a shadow that moved independently through the ether like bolts of lightning. Scrooge followed the spirit into the light and emerged in front of a Best Buy. There were giant “Christmas Sale” banners hanging from above the revolving doors. Scrooge walked into the store where he was confronted by himself. He was wearing a Best Buy shirt and tan slacks, staring aimlessly across the vast expanse of the retail establishment. From the side he spotted Bob walking up to his likeness. “C’mon Scrooge, get to work,” Bob said as he walked by future Scrooge. He was older than he was by a few years and looked malnourished and feeble. As future Scrooge made his way toward the warehouse modern Scrooge followed. Two younger workers were standing near the loading dock as the Scrooges approached. “What’s the matter, Grandpa? Don’t remember where you should be?” one of the young men said as the other laughed. Scrooge looked around helplessly as the two younger men continued to snicker and jest. The light returned and Scrooge woke up. He wasn’t on the settee or in the front room, but his bed. He leaped from the sheets. “Why today is Christmas, sir!” the young man replied. “It’s Christmas day? Of course. Merry Christmas to you my fine fellow.” Scrooge said with enthusiasm. “A merry Christmas to you, too, sir,” the man replied and walked on. Scrooge, went back in his home and started making calls, the first call he made was to Bob, telling him to take the day and spend it with his family; and, that he was going to get a significant raise. The next call was to Jacob, who didn’t answer, but Scrooge left a voicemail that said he was sorry and would like to make it up to him. Finally, he called Global Tech Solutions’s Abraham Brown to tell him that he would be happy to learn more about how he could keep his IT safe and make his business more efficient. From all of us at Global Tech Solutions, we’d like to wish you a very merry Christmas and the happiest of holidays!